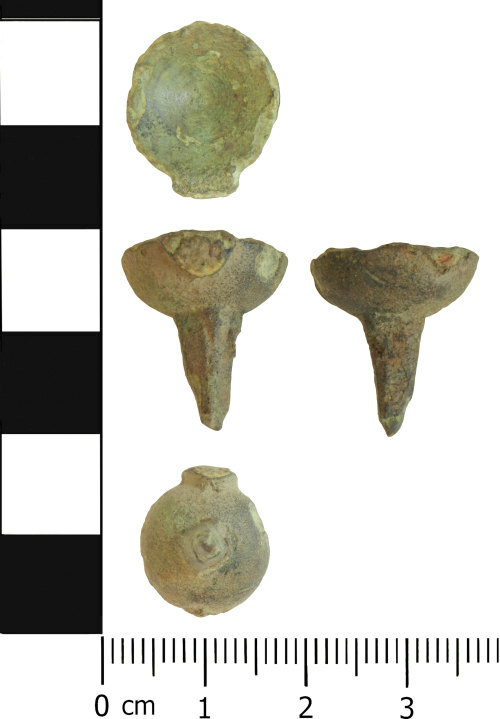 A copper alloy stud of possible Iron Age date. The object has a hemispherical cup with a square-sectioned integral spike projecting from its base. There is a dimple inside the base of the cup (in line with the spike). On the outer edge of the cup at one side is an incomplete semi-circular sectioned projection. The cup may have been filled with enamel, none of which survives. Similar objects are recorded on the database, numbers DENO-410643 (Hazelwood, Derbyshire), DENO-C68707 (South Wingfield, Derbyshire), DENO-3344F6 (Derbyshire - no parish) & NARC111 (Bishop Auckland, Durham). DENO-3344F6 contains the remains of colourless enamel/glass inside the cup. Objects like this occur in Iron Age contexts with parallels from Dinorben, Abergele, Denb. (Savory 1976, Fig 35, 8-10). Dimensions: 14.78mm in length, 16.04mm in width (including projection). 5.2g.